Vaasthu is the natural power and it lifts anyone to his Endeavour The power directly or indirectly creates harmonious vibrations between him and the surroundings. Naturally Vaasthu power may vary from place to place and circumstances. When a normal person having conflict of interest with this natural power, he seems to be in a slightly different path of his personal growth and professional career. Like a kite flying in open air in the sky tries to fly depending upon the nature of air and in the direction of the air succeeds the kite in flying higher, else it may not able to fly higher and faces failure. In short, we should analyze and share the air and the light from all the directions. Vaasthu Shastra is the science containing scientific rules formed by our ancestors with their known thoughts as they were scientifically experienced by the terrible consequence from the air from various directions and light through analyzing and calculating exactly. 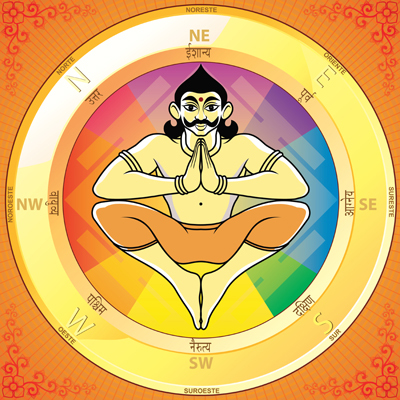 In this rule, the Scientific Vaasthu technology consider the five natural forces (Panchabhutas) namely water (Jala), Land (Bhoomi), Fire (Agni), Air (Vaayu) and Space (Akaasha) which is sensed / analyzed in the given correct proportionate ratio. When a man listens to a music, which may be composed of ten different musical instruments he could be able to find out which instrument sound should be increased or decreased accordingly. For example, when we construct a building, it is true that fixing of doors and windows is a basic necessity. But most of us do not think whether we are fixing them in the correct location or direction. Generally, while thinking of this the cost of construction remains the same. It won’t increase or decrease. According to Vaasthu Shastra, if the entrance and window is not placed at proper position it may affect the belongings of the house mainly his spouse, secondly to him and finally his children. Example, a person’s body parts are placed on the basis of the Panchabhutas. If there is any change that may lead to great effects. In the same way, Vaasthu technology also emphasizes the same things.